Check Out These Hiking Tips for a More Enjoyable Adventure! So, why should you read this page on hiking tips? I mean, most of what you need to know before you go on a hike is common sense. Right? Well,there are some things you might not have thought of. That's where these tips come in. I hope this advice makes your hike a safer and more enjoyable one. -Let someone know your plans. That way if you're not back by a certain time there's someone looking for you. If everyone in your group is taking the hike, let your camp host or hotel manager know when to expect you back and where you're hiking. -Don't hike alone. You are safer out on the trail than driving in your car, but there's safety in numbers. If something happens to you on the trail and you're alone, who is going to get help? I've been on several trails where we were the only ones hiking for the entire 8-hour hike! -Stay on the trail. It's the easiest way to not get lost. The first place they search when looking for lost hikers is the trails. -Stay with your hiking group. It's a scary thing to think you've lost your hiking buddy. I've learned this hiking tip the hard way. Now I know it's better to stay within sight and take my time than to satisfy the urge to finish in record speed. -Check the weather first. It can change from sunshine to rain in a flash. So, check the forecast. It's better to know what to expect than to get caught unprepared. -Always bring a rain jacket. This is a must-do hiking tip for the Smokies. Even if all you have is a trash bag, it's better than nothing. When you get wet, you get cold. When you're wet and cold, there's the chance for hypothermia. Getting chilled to the bone and not being able to maintain enough body heat is not just for winter hiking. You're most vulnerable in wet weather, even in the 50s. -Dress in layers. This is a very important hiking tip. If you dress smart you'll have a much more pleasant hike. With weather and temperature changes due to elevation, plus the exertion of hiking, it's easy to bounce between hot and cold. Dressing in layers keeps you comfortable during your hike. Wear a breathable inner layer, such as wool or synthetics. These keep moisture away from your body. Stay away from cotton. It takes forever to dry, is heavy when wet, and robs your body heat. For your second layer, you want insulation. Go for fleece. Your outer layer protects you from wind and rain. I wear nylon because it guards against the wind and cold. -Wear pants made of nylon or synthetic material. I prefer to wear pants for a couple reasons: ticks and poison ivy. I've had both and keeping my body covered as much as possible cuts down the chances of getting either one. If you've never had ticks, besides it being gross to pull one off, they can carry lyme disease. -Wear wool and nylon-blend socks. They're better than cotton, which absorbs moisture. Changing your socks during a hike also helps keep your feet dry. Another sock tip is layering. Wear a thin liner sock underneath a thicker sock for cushion. This helps prevent rubbing and eventually, ugh, blisters. -Carry enough drinking water. This may seem like a no-brainer, but it's a crucial hiking tip. The rule of thumb is 2 quarts per day per person. I typically bring 2 water bottles with me. Keep in mind that hiking in the mountains usually means lots of sweating. That means you're losing water. Bring enough water that you won't dehydrate. Also factor in the length of the hike as well as the difficulty. -Bring some food for fuel. Lightweight, high-energy snacks are best. Pack some energy bars, dried fruit, cereal, or nuts. You'll be glad you did when you feel like you can't take another step. -Bring a flashlight with batteries:). You'd be surprised how quick the darkness creeps up when you're in the woods. Hiking in the dark isn't fun, and, yes, I know first-hand! -Carry a trail map and orient yourself with it before you hike. 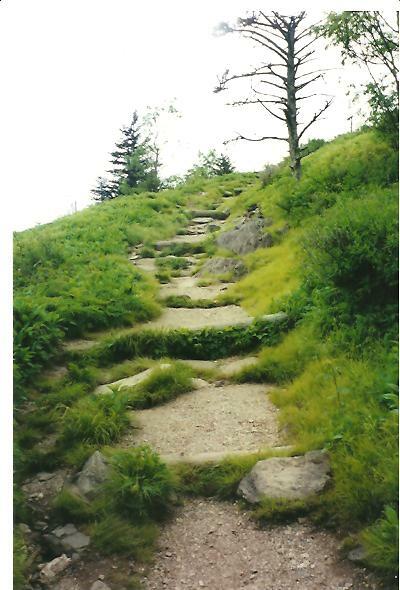 Thankfully, the trails in the Smoky Mountains are well-maintained and easy to follow. If you're hiking any part of the Appalachian Trail, you will see white blazes (painted vertical slash marks) on the trees. One of the many reasons I love hiking in the Smokies is that I know exactly where I am. I loathe getting lost! 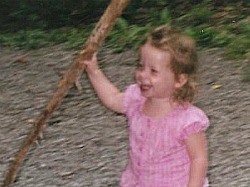 -Hiking sticks are a great help for crossing streams and stabilizing yourself on rocky or slick footing. Poison Ivy is a sure way to put a damper on a hiking trip. Prevention is the key to keep from getting it. --I haven't tried it myself, but I've heard of a product called "Ivy Block." It's supposed to prevent rashes from poison ivy, oak, or sumac. There's always a chance of getting ticks when you're exploring the Great Smokies. Ticks can carry disease, so prevention is the key. Thankfully, there are ways to lessen your chances of getting them. Here are some tips. --Wear long sleeves and pants. This makes it harder for ticks to get on your skin. --Wear light-colored clothing. This makes it easier to spot a tick. --Tucking your pants into your socks helps too. --Spraying yourself with DEET helps to fend off the little buggers. --Inspect yourself daily, before and after hiking, to spot ticks early. --If you find a tick, use tweezers to remove it. Make sure you get the head when you pull it out. Pull straight, steady, and slow. Wash the bite area with soap and water. Make sure to kill the tick once you remove it. --Not all tick bites result in Lyme disease, but stay alert for these symptoms: bull's-eye rash with clear center and flu-like symptoms. Don't Forget This on Your Next Hike! If you're like me, you probably don't have a signal on your cell phone when you're in the Smokies. However, you should still bring it with you when you're hiking. Why? Because even if you have no signal, your phone can still contact cell towers. If you happen to get lost, safety and rescue teams can use your cell phone to find you. So, bring your phone with you when you hike, even if you don't have a signal. Keep the power turned off, but turn it on every so often to see if you have a signal. Plus, this leaves "digital breadcrumbs" for safety and rescue teams. Also, remember to leave your itinerary with family or a trusted friend. Study your map before your hike too. Along with bringing your cell phone just in case, even if you do get lost you'll be easy to track down. Everything has a downside. Bugs just happen to be one of the downsides of hiking. Thankfully, there are ways you can avoid these pesky creatures. Here are some tips to make your hike less buggy! --Wear lighter colors. Darker colors absorb heat, which attracts mosquitos. --Stay scent-free. Refrain from using perfume or fragrant lotions. Bugs like their smell too! --Keep covered. The less skin you expose, the less likely you'll get bitten. --Use a bug repellant. Go for products containing DEET. If you want to steer clear of chemicals, try citronella instead. --If you do get bit, don't scratch. I know it's hard, but that only makes it worse. Treat the bite immediately. 1. Stay on the trail. It's so simple, but most lost hiker cases are from people who decide to "make their own trail." Please don't be one of them! 2. Be aware of your surroundings. Pay attention to landmarks. Take mental note of rivers, streams, and anything else that sticks out to you along your hike. 3. Stick with your hiking buddy. 4. Keep track of the time. 5. Use a map and study it before your hike. In the event you find yourself lost, don't panic. Staying calm is so important. At the moment you realize you don't know where you are, backtrack to the last point where you did know where you were. --Don't hike too fast, especially over rough terrain. 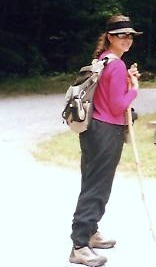 --Use a hiking stick or trekking poles to help maintain your balance. --Check rocks for stability before putting all your weight on them. This is another great use for a hiking stick. --Make sure your shoelaces are tied tightly to keep your feet from slipping out. --Drink plenty of water. Dehydration makes you weaker and feeling disoriented. --Tighten up the straps on your pack so it feels snug against your body. This keeps your pack from flapping against you, knocking you off balance, say... when you're rock-hopping. Taking care of your feet is essential when you're on them for hours at a time on a hike. We've all had blisters at one time or another, but there are ways to help prevent them and stop them from getting too bad. --Break in new boots/shoes before your hiking trip. --Use cornstarch or foot powder to keep your feet dry. --Change your socks halfway through your hike. --Don't break a blister. The fluid protects the skin. A better idea is to make a "doughnut" bandage. Do this by cutting a hole the size of the blister in the middle of the bandage. This way the blister can breathe and reduces friction too. Forget to pack an extra pair of hiking shoes? If you get caught in the rain on your hike and your shoes get wet and don't have a spare pair, try sandwich bags. Just put the bag over your socks before putting on your still-wet shoes and the bag will keep your socks from getting wet. I've tried it and it works. I didn't have any problems using the bags. Photos are a great way to capture waterfalls, scenic views, and wildlife you discover out on the trail. What a disappoint to get your pictures developed and they don't turn out the way you saw them on your hike. Use these tips to make your next photos great ones. --An unsteady camera leads to blurry photos. Avoid this by leaning against a tree or some other nearby solid object. A tripod is another option, if you don't mind carrying it. You could also sit down and prop your elbows on your knees. --When taking photos of wildlife, remember that they tend to blend in with their surroundings. Sky and water are the best backgrounds. --Try not to take pictures on really sunny days. The colors will look weak. An overcast day is better for taking photos. Remember that the more pictures you take the better. That way you can choose from the best.